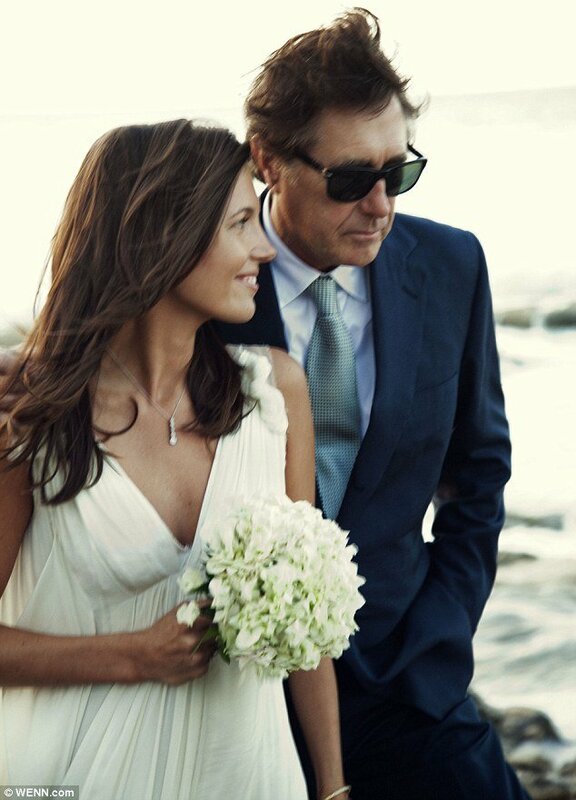 Roxy Music star Bryan Ferry and his younger girlfriend Amanda Sheppard married in a romantic island ceremony. Bryan Ferry, 66, and Amanda Sheppard, 29, have tied the knot in a simple private ceremony at the stunning Amanyara luxury beach resort on the Turks and Caicos Islands last week on January 4th. Amanda Sheppard wore an ethereal Lanvin white dress for the ceremony, while Bryan Ferry looked dapper in a dark blue suit by Anderson & Sheppard. This is the second marriage for world-famous crooner Bryan Ferry, who was married to Lucy Helmore, with whom he has four children, for 21 years. Bryan Ferry also famously dated Jerry Hall for two years before she left him for Mick Jagger. Following his divorce from Lucy Helmore, Bryan Ferry began dating dancer Katie Turner, 35 years his junior. During an interview last year, Bryan Ferry said he was “fortunate” to have snared himself a younger girlfriend. He said: “The interesting thing is – and I don’t want to say the wrong thing in case I get into trouble with my girlfriend – you never really meet people your own age who aren’t married. “I’m very fortunate that I work in music, where you’re in touch with different age groups, either the audience or people you work with. When Bryan Ferry and Amanda Sheppard first started dating back in 2009, many people doubted whether their relationship would last. A source said at the time: “No one expected the fling to last, but it’s getting quite serious. However, a few months later Amanda Sheppard quit her job as a London PR girl after Bryan Ferry offered to financially support her, and moved in to the singer’s London home. Amanda Sheppard was absent from Buckingham Palace last year, however, when Bryan Ferry collected his CBE from the Queen. Bryan Ferry was instead accompanied by his sons Otis, 29, Isaac, 26, Tara, 21, and 20-year-old Merlin.